There are plenty of highlights, including Homer & Jethro (who do their hit “Battle of Kookamonga” and an hilarious spoof on “Jambalaya”), Johnny Wright (“Move it on Over”), Pete Drake, who performs “Forever” with a talking guitar (a weird device that includes a long tube he has to stick in his mouth), Lefty Frizzell (who plays guitar right-handed; what up wi’ THAT? 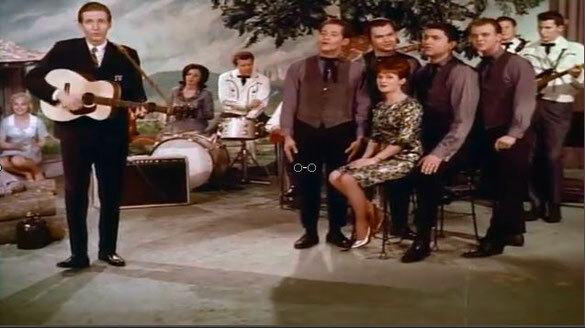 Anyway, he does “If You’ve Got the Money, Honey” and “Saginaw, Michigan”), Bill Monroe and his Bluegrass Boys (“Mule Skinner Blues” and “Blue Moon of Kentucky”, and I see why Elvis loved this guy), George Hamilton IV (“Abeline”), Sonny James (“Young Love”), Minnie Pearl (a comedy routine, and “Careless Love”), Kitty Wells (“It Wasn’t God that made Honky Tonk Angels”), and Del Reeves, who does song parodies of Walter Brennan and Johnny Cash. Other performers include Little Jimmy Dickens (who was indeed very short), Carl & Pearl Butler (she’s scary; she looks like the sadistic warden in a “women in prison” movie), Dottie West, faron Young, Billy Walker, Connie Smith, Buddy Spiker, Webb Pierce, and… well, I think that’s everybody. Except the two stagehands are none other than Leo Gorcey and Huntz Hall, a decade after their last Bowery Boys film together. Although they’re called “Leo” and “Huntz”, they do their old routines, with Huntz getting hit with Leo’s hat a lot. Huntz gets a lot more to do; Gorcey seems obviously inebriated. They’re funny, though, and it’s a treat to see them together one last time. This movie obviously was a real cheapie to make, but it’s an awful lot of fun to watch.